Have you ever gotten a stamp set and had your head fill up with ideas?! That’s how I feel about this adorable Honey Bee Stamps Blah Humbunny stamp set. You can see my prior silly card combining one of these bunnies with the Blah Bunny stamp for a silly/funny card HERE. For this card, I knew I needed a card for a family member who contrary to all of our wishes won’t be joining for our family beach holiday due to work commitments. I first cut out a larger than normal card front and stamped out the top portion of one of the Blah Humbunnies tilting into frame (I chose the bunny whose ears flopped in the right direction for the tilt). 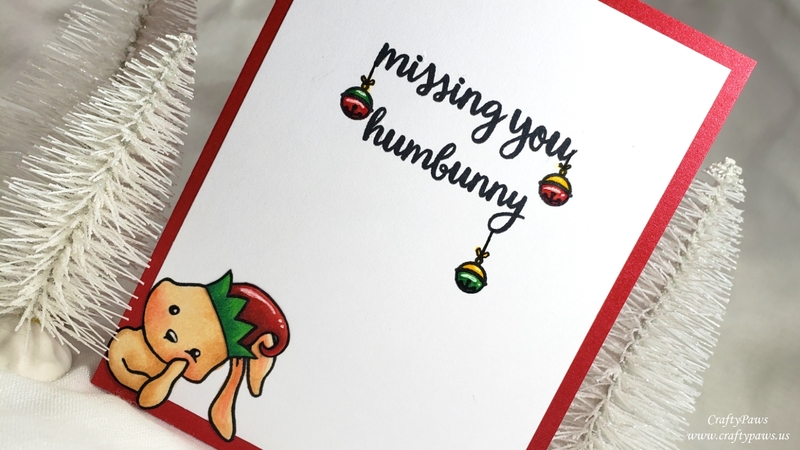 Then I stamped out the sentiment, “missing you humbunny” also from the Honey Bee Stamps Blah Humbunny stamp set. To add a little holiday whimsy, I also stamped out three ornaments from the stamp set and drew in hanging lines from the sentiment to the ornaments with a 0.1 pt Copic Multiliner Pen. I added white highlights on the ornaments, elf hat, bunny eyes and bunny nose with a Uniball Signo White Gel Pen and emphasized the black of the bunny’s eyes with a 0.03 pt Copic Mulitiliner Pen. I also coated the elf hat and the ornaments with a Clear Wink of Stella for a festive shimmer. Using a shimmery red card base, created a red frame around the card front. 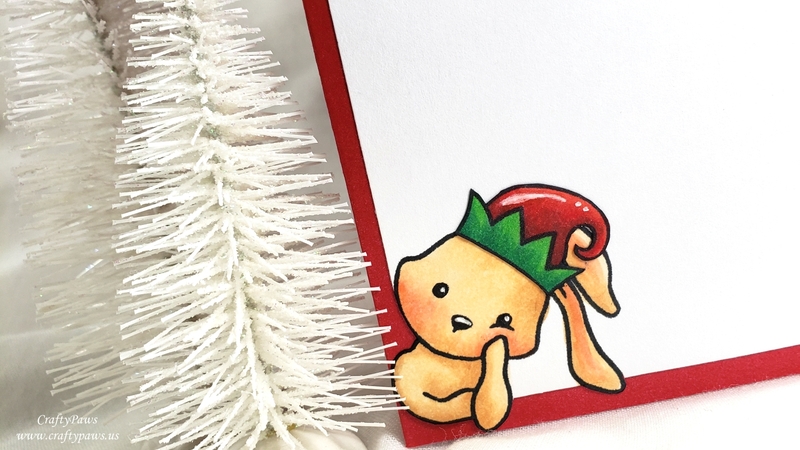 To add a little interest to the card and make it look like the bunny was leaning into the frame of the card front, I fussy cut around the bunny’s arm and elbow and cut down the card front, leaving a 1/4″ red border all around. This is so adorable! 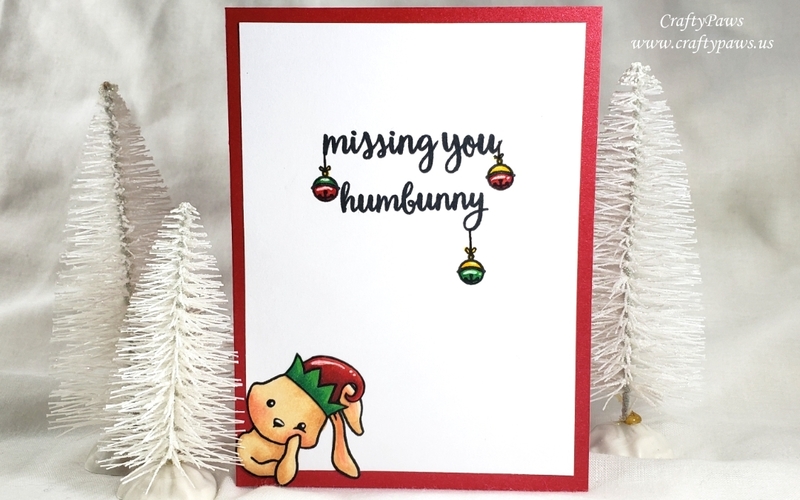 Gorgeous CAS card with the sweetest little Christmas bunny and a lovely sentiment decorated with Christmas bells. Fabulous work! 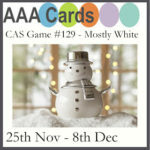 Thank you for sharing your card with us at the Crafts Galore Encore “Anything Goes” December Challenge. Good Luck and hope to see you again! What a sweet bunny! Thanks for playing along with us at AAA Cards! Aww… so cute! Love that little bunny. Thanks for playing at AAA Cards challenges. What a sweet and lovely card! Aww we, so sweet! Thank you so much for entering our ATG challenge at Crafter’s Castle this week. We hope to see you next time too! Thanks so very much Jeanie! Happy new year! Super cute! I love the way you hung the little ornaments off the words! Thanks so very much Janie! Awwww, how sweet! 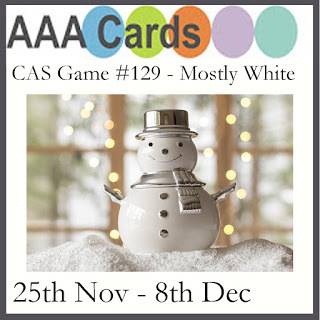 Great CAS card! Thank you so much for entering our ATG challenge at Crafter’s Castle this week. We hope to see you next time too! Thank you for always leaving such kind words, Jeanie! Thank you soo much for taking part in our “anything goes with optional use a stencil” challenge over at Creatalicious & good luck in the draw.